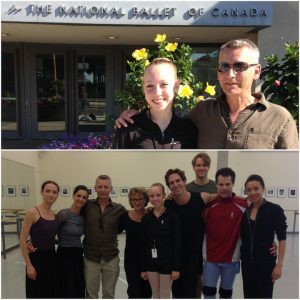 How does one improve an already wonderful summer intensive at Canada’s National Ballet School? Perhaps by spending a day with Mr. Carney at The National Ballet of Canada, watching company class and sitting in their studios all day for rehearsals. Additionally, meeting Ms. Karen Kain and receiving gifts of NBoC souvenir books. It doesn’t end there! Also, watching as NBoC dancers and Ms. Kain autograph the gifts and having your photo taken with Jackie Barrett and NBoC Principal Dancers. Now that’s got to be one of the more amazing days in the life of a ballet student! FVAD Pre-Professional II student Marin poses here with Mr. Carney, Jackie Barrett and NBoC Principal Dancers. Thank you so much Jackie and all of the lovely staff and dancers at NBoC for allowing us to have such a magical day!